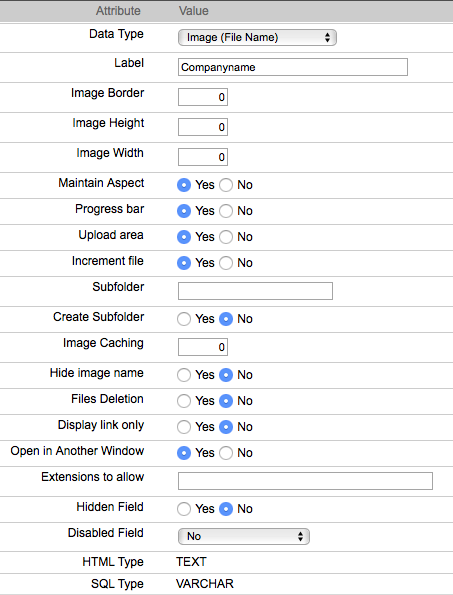 Allows the developer to use fields in the forms to upload images. The images are save in the server in a directory defined using the Application Settings menu in the attribute Image Directory (see Settings). Data type - Define the application field type. When a field is defined as Image(file name) type, it stores a file name that is available to the application to process as such. The images are stored separately in the server and automatically displayed when the file name is referenced. Progress bar - Display or not a progress bar when uploading files. 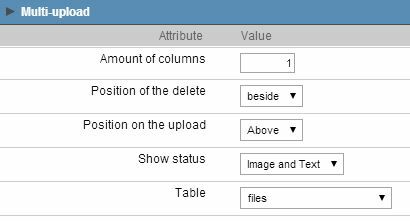 Upload Area - Define if a drag'n drop area is used to upload files. 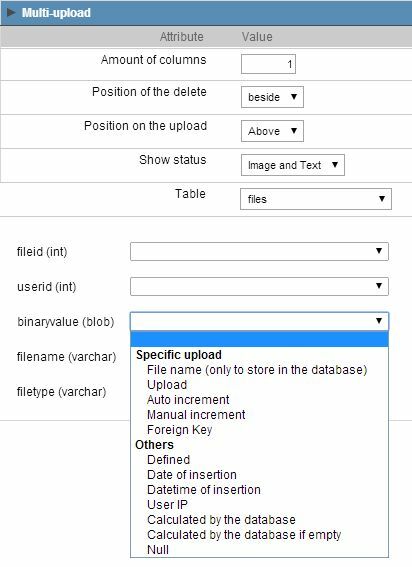 Increment File - Increment the file name if it already exist in the folder of uploads. SubFolder - Defines a sub folder to organize the files stored. Create Subfolder - Creates the subfolder if it does not exist. Image Caching - Time in minutes the image cache will be kept for on the server before being deleted. Resize function generates temporary image copies that are kept in the cache. Hide image name - Hides the image name during the upload. Files Deletion - Allows to delete the file in the directory, relating to the deleted record. Extensions to allow - Define which extensions are allowed to upload. Separate several extensions using semicolon. 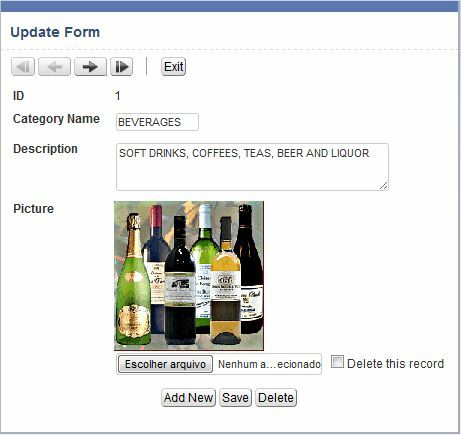 Example of field of the image type in a cadastre of products. It allows to upload multiple files and store the information in a relative database table. Amount of columns - Amount of columns to display in Multiupload. Position of the delete - Position of the checkbox to delete. Position on the upload - Positioning of the records upon upload. Show status - Show the upload status. Table - Choose the database table to store the files. 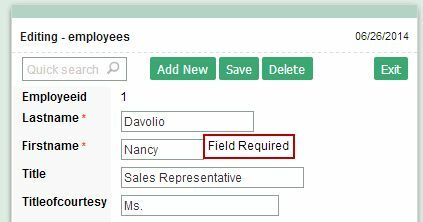 After choose the table, it will display all fields from that table and we should associate parameters to fill the fields upon inserting or updating. File name - Gets the file name that is being uploaded. Upload - Gets the bynary of the file. Auto increment - Used just when the database field is AUTO INCREMENT or similar, if your DBMS uses sequences to implement auto increment a field to enter the sequence name is displayed . 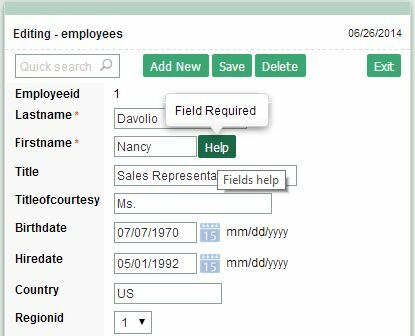 Manual increment - The generated form will handle the auto-increment feature by calculating the field's value automatically before inserting a record. 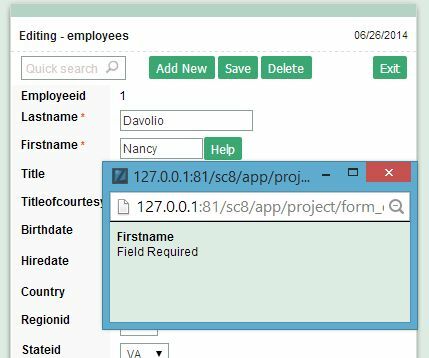 Foreign Key - Allows to associate a field value from the current form. Defined - You can specify a constant value or use global variables [global_var]. Very useful to passing parameters.. Date of inclusion - Get the data from the server upon inserting. Datetime of inclusion - Get the data and time from the server upon inserting. User IP - The field will be filled with the IP of the computer that is accessing the application. Calculated by the database - The field value is assigned by the database. Calculated by the database if empty - The field value is assigned by the database if no value is passed to it.